Heavy duty nitrile gloves. Small flashlight. Patience. I found it necessary to loosen the top star bolt that holds the horn bracket to the frame so that I could push the horn back out of the way to give my hands more room to work, but it wasn't necessary to remove the horn. And I wear size large gloves, so I don't have small hands. I think it does help that I am a keyboard player by trade, so I have spent a lifetime honing fine motor skills with my fingers. Took me about 30 minutes and I really took my time, checking and double checking at every stage so I had a picture in my mind about what needed to be pushed where. Next time will take about 10 minutes. The biggest pain was that start bolt that holds the horn bracket. Not a lot of room for a socket wrench. This is the wet head forum, right? I was able to get a picture of the area where all the problems are with this job. Seeing exactly where to push in and push aside, really helps with this "touchy feely" job...there's just no way to watch what you're doing! Yup, but the RS, GS, and R are also wet heads. Thanks for the pencil tip. I will be replacing my high and low beam this weekend. I've done some reading and, just about everyone, says the job is a huge pain. Some poeple seemed to have disassembled half of the bike. I've done some reading and, just about everyone, says the job is a huge pain. Some poeple seemed to have disassembled half of the bike. Poco - It's not a huge pain, but it does require patience. My view is that getting the horn out of the way makes the job a lot easier. Visualization is an important part of a successful and stress-free result, I'd say. Read the manual. No disassembly is required to replace the low beam, but you will have to remove the speaker cover and speaker to get to the appropriate high beam bulb. As has been said before, visualize what you're doing (a good time to RTFM) then taking it slow and easy. It's really not that difficult! I posted a photo here w/ the exact same message. It took a while to be able to feel these humps but when you do the struggle is mostly over. I could do it now in less then 10min start to finish I'm sure. In 37K miles I have not had a new low beam burn out, but I replaced the original preemptively at 14K miles after reading stories of people having them burn out every 4-5K miles. 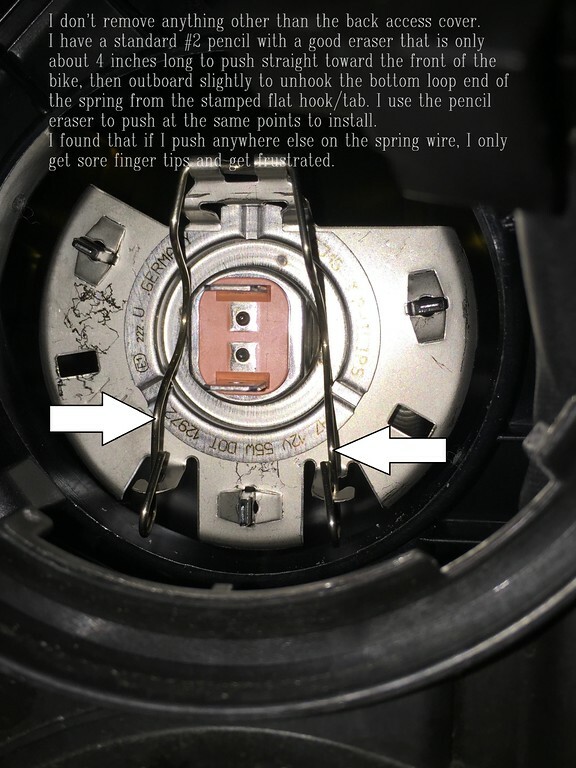 When I replaced the original bulb I installed a used H7 w/ about 4K miles on it and that took me a while because I applied force to the ends of the wire where they loop, but that is a lesson in frustration. Once I got on to where to apply force it became easy to do w/ very low risk for harming anything including your fingers. I keep a very thin Cabretta leather golf glove in my trunk which helps get good friction between wire and finger tip when moving the wire clips. Seems like it would be easier to do blindly than using a pencil eraser tip, but I have not tried it myself. Low Beam Bulb Change in 10 Minutes!